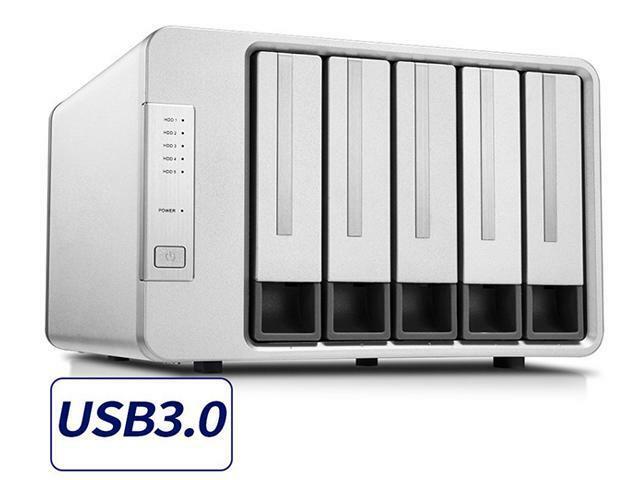 TerraMaster D5-300 seats with its USB 3.0 housings for up to five 3.5-inch or 2.5-inch drives. Appropriate fastening screws are supplied in sufficient quantities. 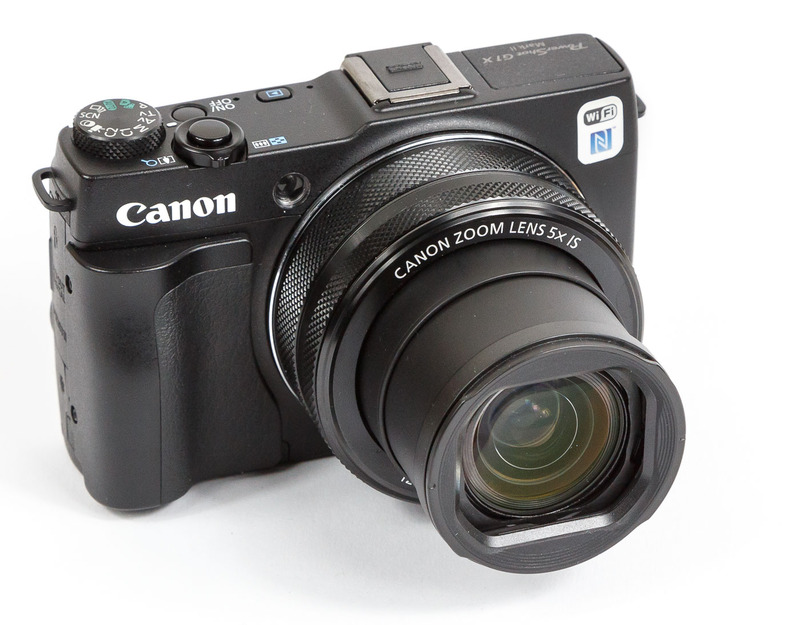 The frame of the housing of the D5-300 is made of metal, the five drive rails are made of plastic and sit slightly too loose in the housing. There are other manufacturers of multi-Bay enclosures, where despite plastic rails, nothing rattles. 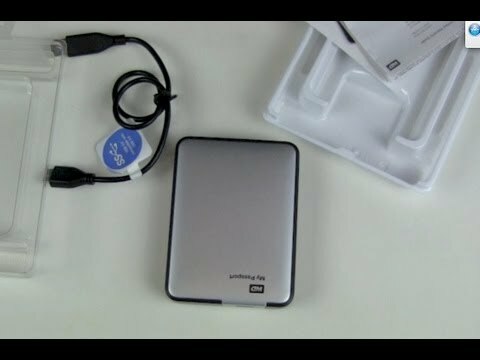 Easy set up of the drive using an English-language PDF manual that contains only the most essential information. Here, we would have expected at least a brief explanation about the different RAID modes. The link in the quick installation guide led to an online manual, which was available at the time of the test only in an English-Italian mixed version. 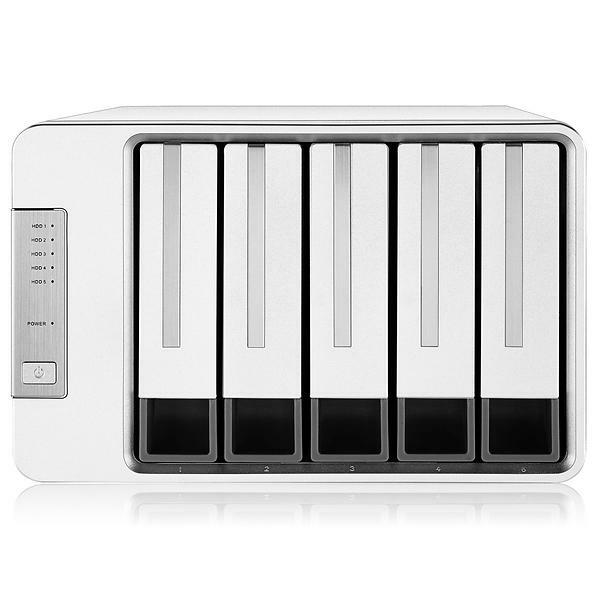 To configure of his drive is TerraMaster on its homepage “HD RAID Manager” ready for Windows and Mac OS. 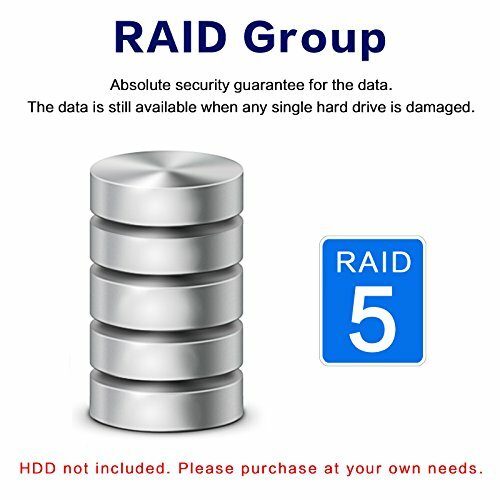 The tool provides status information on the internal HDD, and enables you to create different types of RAID. 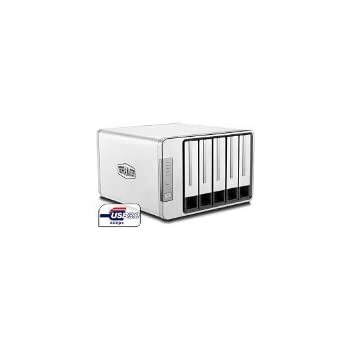 For our test, we have four identical 3.5 inch hard drives from Western Digital (WD red WD40EFRX) set up as RAID-5. We have simulated lubricate an internal HDD by pulling out one of the four drives on the fly-while we played a full HD movie on the D5-300. The film without continued without any interruption. Back when we had the HDD, the D5-300 immediately began the rebuild of the RAID. 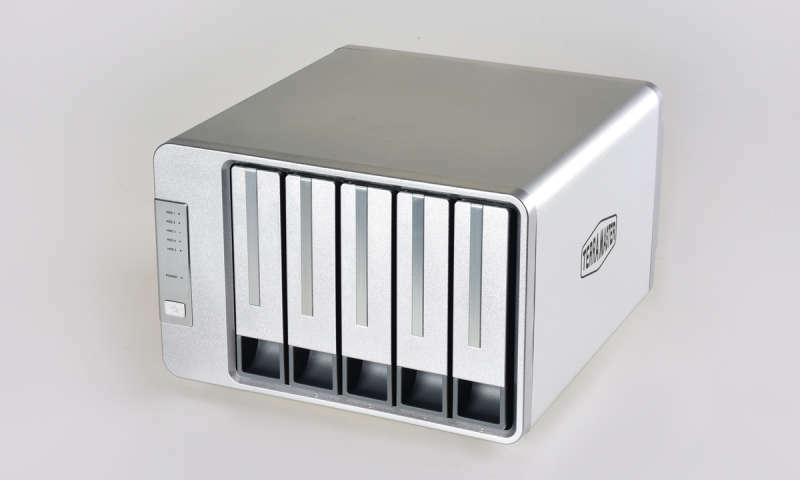 In the RAID-5 array, we achieve maximum, sequential transfer rates of 230 MB / s reading and 182 MB / s write. 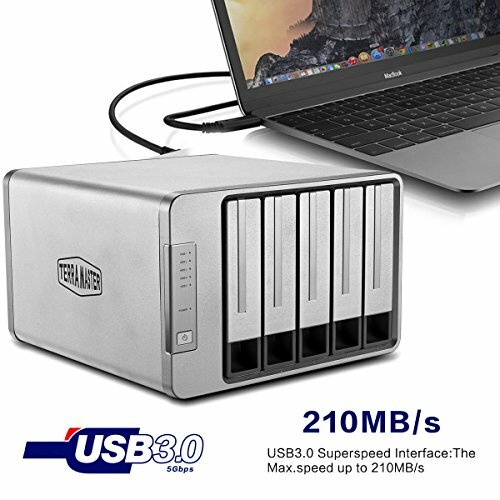 For comparison, a single plate of WD which was connected by USB 3.0-SATA adapter to our test computer, comes at read and write on each 158 MByte / s. In the HDTune benchmark, the TerraMaster drive in RAID 5 arrays with 194 MB/s read and 126 MB/s write cuts significantly better than a single drive with 114 and 107 MB/s down. The TerraMaster housing is switched on and off via a button on the front panel. The switched off the appliance consumes about 1.5 watts power.With our four 3.5-inch test plates the D5-300 idle consumes about 21 Watt, what will still be fine. 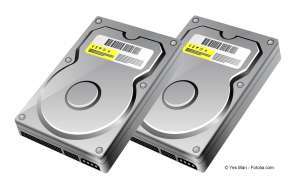 The two built-in fans turn softly and are drowned out by the noise of the 3.5 inch drives. 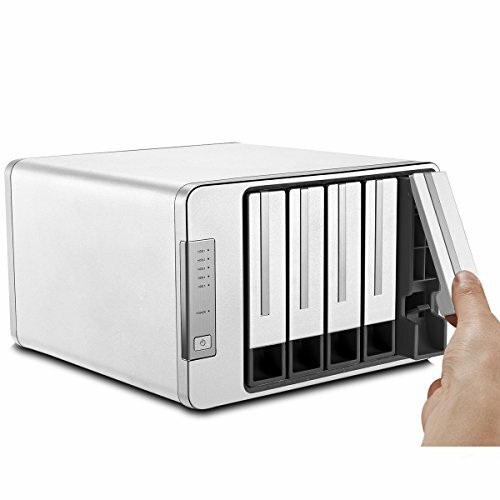 TerraMasters 5-Bay-USB 3.0 enclosure offers plenty of space for external, secured by RAID storage. Changing a drive works fine on the fly. 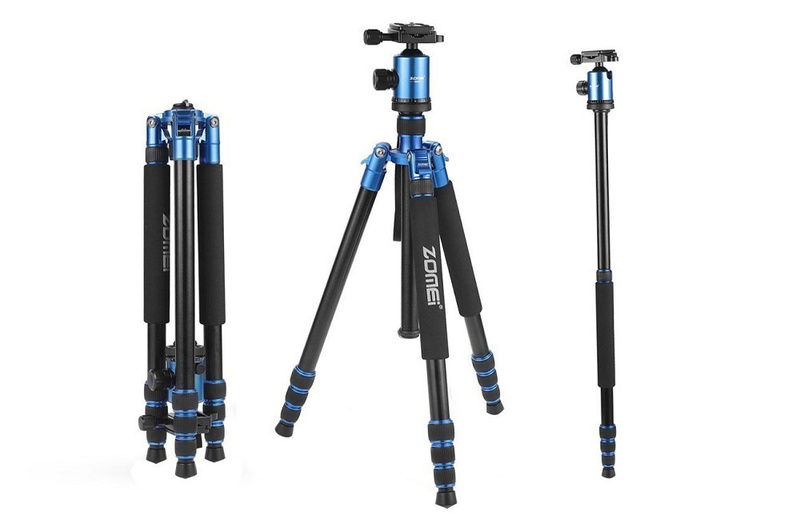 The plastic rails could sit however slightly firmer in otherwise stable metal housing, especially as one must at least lay down 250 euro for the D5-300 as empty housing. Despite easy operation RAID Manager tool TerraMaster could put more value on the documentation of its hardware.